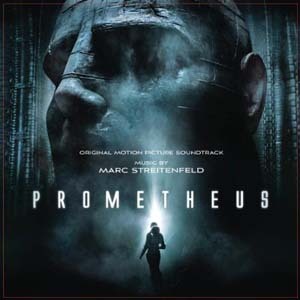 Sony Music announces the release of the Original Motion Picture Soundtrack of Prometheus. The film which opened on on Tuesday, June 8, 2012 includes stirring music written by Marc Streitenfeld for a film that combines human mythology with science fiction. Directed by Ridley Scott who's roll-call of successful films includes Alien, Blade Runner and Gladiator, now returns to a genre for which he is renowned with a story set in the late 21st century. With Prometheus, he creates a groundbreaking story in which a team of explorers discovers a clue to the origins of mankind on Earth, leading them on a thrilling journey to the darkest corners of the universe. There, they must fight a terrifying battle to save the future of the human race. Scott's cast features some of the most exciting actors of recent years, among them Noomi Rapace (who playedLisbet Salander in The Girl with the Dragon Tattoo), Charlize Theron (winner of an Academy Award for Best Actress in Monster) and, in the role of an android, Michael Fassbender (Inglourious Basterds, X-Men: First Class, Shame).